NEW YORK, New York —As Armenia Fund USA was gearing up for its 13th International Thanksgiving Telethon in November of 2010, construction was commencing on Martuni regional hospital in Karabakh, the second multi-services inpatient and outpatient treatment center in the region erected by Armenia Fund following its 2005 construction of the Armine Pagoumian Polyclinic and Anna and Hirair Hovnanian Diagnostic Center in Stepanakert. Martuni regional hospital is already over 10% implemented, with the design and bidding processes complete and construction underway, bringing the 23,000 residents of Martuni and its surrounding 30 villages that much closer to receiving superior medical attention. Healthcare delivery in Karabakh is inconsistent at best, with residents of far-flung towns and villages bearing the brunt of the effects of an incomprehensive system. Clinics and health posts exist to attend to the primary care needs of villagers but the buildings that house them are often enough to dissuade patients from seeking help in the first place. Martuni’s existing hospital was no exception. Built in 1965 and consequently ravaged as much by age as the Azberbajani-Karabakh War, patients would frequently take one look at the building before going elsewhere. In spite of its appearance, the dedicated and capable 107-person staff of doctors, nurses and healthcare professionals still managed to serve nearly 18,000 outpatients and 1,200 patients annually, an impressive figure that the new hospital hopes to further increase with what is to be Martuni region’s sole hospital. Additionally, an enhanced laboratory-diagnostic unit will also be utilized by the Hadrut region for the purposes of attending to endemic infectious diseases in both Martuni and Hadrut. To bolster both the ease of execution of rebuilding Martuni’s hospital as well as contribute towards its long-term sustainability, Armenia Fund USA is focusing on Karmir Shuka village, also in Martuni, as the point of departure for its contribution towards this year’s Telethon campaign of rebuilding Karabakh’s water infrastructure. When completed, these two simultaneous, symbiotic projects will substantially increase the quality of life in Martuni, growing a region of strategic and administrative importance for Karabakh as the government further develops its healthcare system. In keeping with this broader goal, the NKR government will absorb all post-construction needs as they arise as well as accept responsibility for all maintenance, in addition to co-funding construction of what is currently estimated to be about $1.8 million project. Armenia Fund USA and the Armenian Medical Fund, USA are contributing $300,000 each towards the hospital’s construction and training of its employees. As this exciting project proceeds on schedule, naming opportunities for the facility’s numerous departments abound, including the laboratory and its corresponding diagnostic units, polyclinic and departments for infectious diseases, gynecology, emergency medicine and surgery, to name but a few. 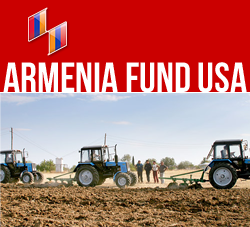 Please contact Armenia Fund USA Executive Director Irina Lazarian (201-639-3985) to discuss your involvement. The foundation is in the process of being laid: both literally for the twenty-five bed, two-story structure, and figuratively, for better medical attention in Martuni. Getting sick and getting hurt, sadly, are inevitable. Confronting a substandard hospital, however, does not have to be.